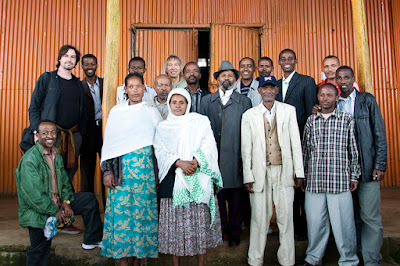 The team traveled up to Shiromeda district of Addis to visit the Entoto settlement. In the weavers’ cooperative office, we met five men and two women elders accompanied by eight members of the itinerant weavers cooperative from the Gammo highlands. The mission and work of LCS were highly appreciated by the cooperative participants, who expressed that the community would be happy to cooperate with LCS if the activities related to traditional stories and other folklore could be done in their current place of residence as well as in their original regions. There are many itinerant weavers in Addis, who have lived on weaving for more than 50 years. Pride in their high-quality work, designs and skills was very evident. 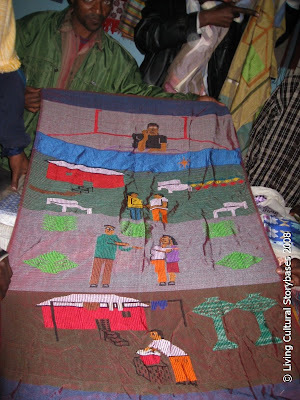 The weavers are very rich in the skills of the weaving art and possess traditional knowledge that has been passed down through many generations and shared among the community members. Many of these weavers are also very capable in both adapting and inventing various new weaving designs. But often when their newly created designs are sold to a retailer, the retailer hires other weavers than the inventors, and they then plagiarise the Gamo designs at cheaper prices. Capital for investment in looms is also difficult to accumulate. Microfinance loans (3% per month interest) are possible, but even the minimum deposit eg of 1000 Birr for 5000 Birr credit is difficult. Though the weavers endure time consuming, back breaking and often exhausting labour to create their weaving craft, they do not benefit fairly from their products. Much of the benefit goes to the middlemen engaged in domestic retailing and export. The weaver doesn't control the price for his product; rather it is the retailer. This is mainly because the weaver is very poor with hardly adequate financial power to cover even the daily living expenses for his family. This situatation deprives him of any negotiation power in the value chain of the products' market. 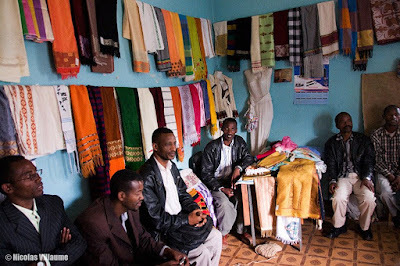 Atsede Dangerssa, a wife of a weaving designer, for example, quantified the exploitative relationship between weaver and retailer as follows. Her husband would have to pay about 100 Birr (nearly 10 USD) for labour, materials, electricity, water and house rent in order to produce a complete women’s dress in a week. He would sell this dress for 150 Birr (about 15 USD) to the retailers whereas the retailers who have shops, would then sell it for 500 Birr (about 50 USD). In another example, the raw material for a dress costs 20Birr, the weaver invest 6 hours of work and sells the fabric to the retailer at 30Birr, who in the end sells it at 70Birr. Even more galling, there had been attempts to plagiarize the Gammo Weaving Communities’ designs in the past which have even been awarded first prize at an International World Trade exhibition. A weaving products export company had publicized on a magazine page that the highly attractive and expensive designs it collected through purchase were the sole property of that company and even stated that no other entity would claim copyright. Luckily enough, this ownership claim was disproven by actions some weaver cooperative members then took. Because of such unbalanced trading conditions, the weaving community members have remained and still stay extremely poor. 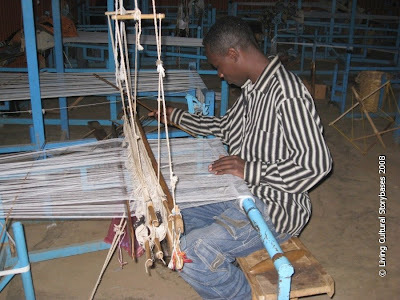 As a consequence, many are looking for a way out of weaving and abandoning the activity altogether in the face of rapidly rising, current living costs, compounded by a rapid population growth that weaving income cannot support. A participant in the meeting, Goqa Goamasha stated that he joined weaving in his later years pushed into the work by the conditions of agricultural land shortage and infertility in his place of origin (the Gammo highlands). He colourfully expressed the failure of some modern farming approaches saying, “The agricultural land has been known to collect bribes!” (referring to the continued artificial fertilization that the land needs after fertilizer introduction). He had been advised by agricultural development agents to use the artificial fertilizer if he wanted large harvests. Accordingly he introduced the fertilizer on his land but couldn’t continue to use it next season, as the prices of artificial fertilizer escalated. He also had stopped producing the traditional manure fertilizer in the hope that he would be using the new artificial fertilizer. Thus the farming cycle was disrupted, pushing the peasant farmer into the weaving work in Addis Ababa. This weaver (Goqa Goamasha) was lucky enough to join a weaving-art training program organized and conducted by Dr. Nitty (An Indian). The latter had trained some weavers in innovative design and entrepreneurship. Dr. Nitty had also facilitated an international market for those weavers and promoted their products. During this period Goqa Goamasha earnt a good income. However, after the relation with Dr. Nitty ended (probably along with his international outlets), the weaver’s favourable income also stopped, returning him to poverty. Atsede Dangarssa, a wife of a weaving designer also emphasized the women's issues in the weaving community. She pointed out that both girls and women of this community would walk to the eucalyptus plantations around the suburbs to cut down trees, carry firewood to the city and sell it - after considerable searching in the city for buyers. These females are often attacked by vagrant rapists. Many community girls, engaged in firewood collection at the expense of school time, are not sufficiently competent to continue their further education. Consequently, either they stay as wood collectors, run into a marriage or fall into risky activities in the city. 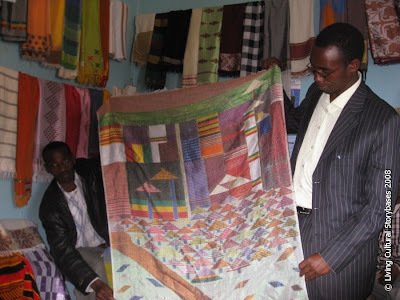 As final comment, the weavers hoped that the visiting LCS team could work to help restore the pride of the weaver community, attempt to establish known brands for the weavers’ products, open up an international market for the weavers’ products and revitalize the weaving craft that is presently at risk of abandonment. They spoke of the young people's disinterest in continuing the hard work of the weaving tradition, which can conflict with education time. In response, the team suggested to the cooperative that a clearer market focus (mass low-price items vs. niche high-price or even commissioned artwork), with a clear brand labelling to mark authentic products and their own organised distribution might increase their share of the value chain. They warned that online sale of craft work over the Internet is not so simple, because of the logistics of fulfilment, export/import regulations and promotion required, although online craft sale aggregators like the Community Friendly Movement might assist (http://www.whycfm.org/). Finally, LCS are developing some novel new ways in which the stories of the weavers and the meanings of their designs could add value to their products, especially for commissioned items or some of their newer Gammo designs which tell a (moral) tale, just like the concepts which LCS are currently exploring with a similar weaving community in Peru. Concluding the meeting, the team visited the weavers' working premises and saw samples of their fine high-quality products in the weavers’ cooperative shop.